It has been a while since I looked at The German Files but while choosing some ideas for a class I gave on soups for a children group, I thought of an old favourite of mine. 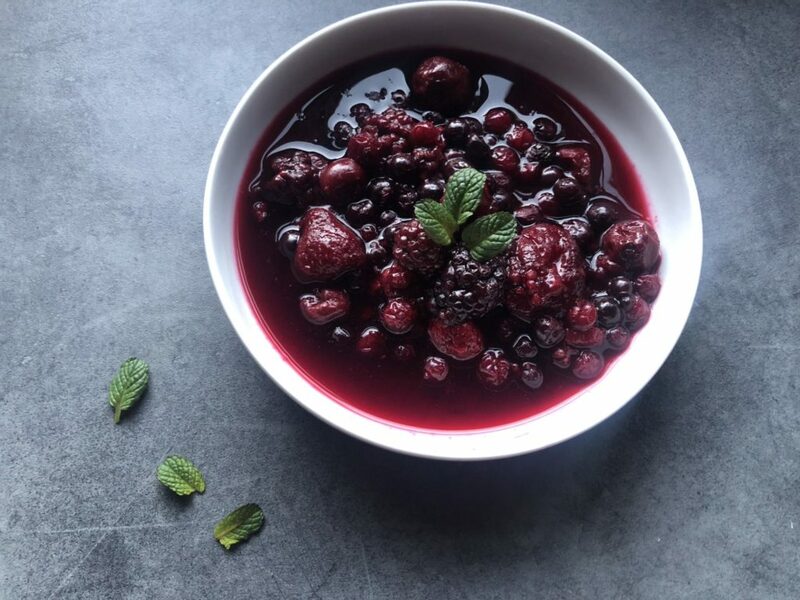 Rote Grutze is not the most appealing name for a beautiful and utterly delicious mixed berry soup but in the North of Germany, it’s a summer favourite. Served with custard, the mixed berry soup is wonderfully refreshing when served cold but also utterly tasty when warm. The use of cornflour binds the soup just enough to prevent it being too liquid. Traditionally, the soup is made with fresh fruit but since we are in the middle of January, I had to use frozen fruit. And to my utter surprise, it worked perfectly. I am using cranberry juice but in Germany it is made with blackcurrant juice. To be honest, any red juice will do. The amount of sugar is based on the tartness of the juice and how sweet you like it. Consider eating this on a hot summer’s day – the tartness of the soup will give you a great boost. Normally I would make my own custard but to be honest, ready-made is fine as well. Measure 125ml of the juice and mix it well with the cornstarch. In a saucepan, add the rest of the juice and sugar and heat over a medium heat until the sugar has dissolved. Bring to a boil. Add the juice-starch mix to the hot juice and stir well until well combined. Add the fruit and stir well. Take off the heat and leave to cool. The soup will slightly thicken while cooling. Pour into serving bowls and leave to cool completely unless you like to warm.